Step 1. Choose where you would like your dog's photo to appear. 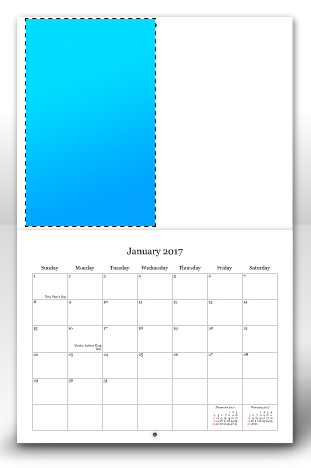 The blue boxes in each of the calendars below show where the photo will be printed. Can't decide, don't worry you can choose multiple items. Step 3. 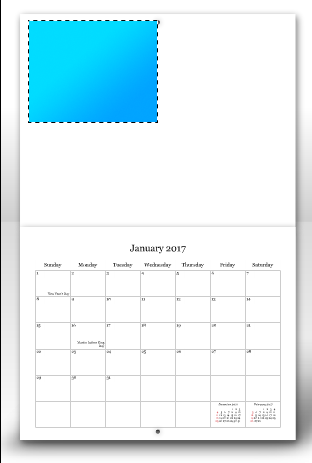 Specify the date(s) or month(s) that you would like you photo(s) to appear on. We will accommodate everyone on a first come, first serve basis so please include your first and second choice. Step 4. 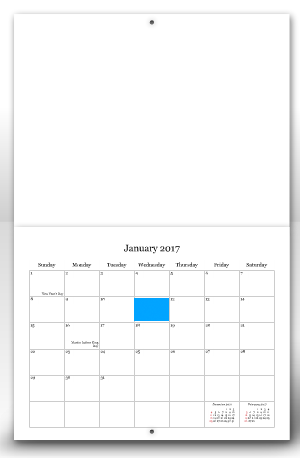 Calendars make great gifts. And since your dog will be featured in it, we're offering you the opportunity to order additional Sochi Dogs calendars at a special discounted rate. Give them to your friends, family, and colleagues. They make great stocking stuffers! Step 5. Now place your order and we'll send you detailed instructions on how to submit your photos.